Samsung is giving its Gear IconX hearable an update for 2019, with the company revealing the new Galaxy Buds at its Unpacked event. Joining the Galaxy Watch Active and the Galaxy Fit fitness tracker, the new earbuds look quite similar to their predecessor, but Samsung has made some decent improvements under the hood. That includes better sound, which has been tweaked by AKG, the sub-brand Samsung acquired when it purchased Harman back in 2017. 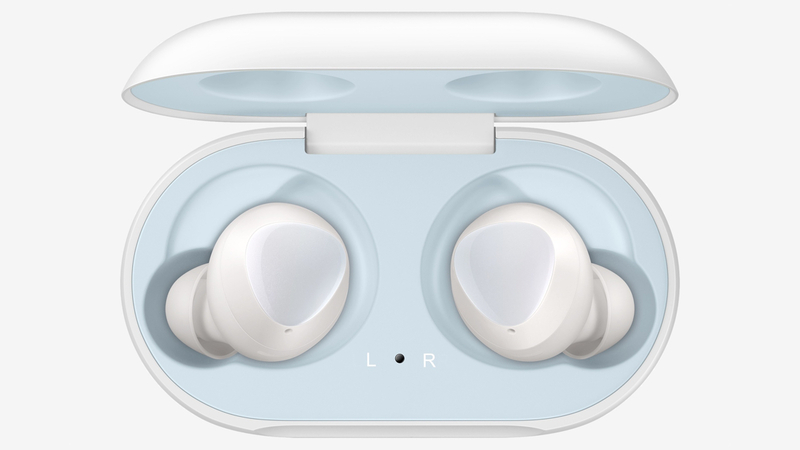 The earbuds once again use Samsung's "enhanced ambient sound" mode, which allows a certain amount of outside noise to leak in while the buds are in your ears. Each earbud also has two microphones - one inner, one outer - which should help improve the clarity of conversations too. Battery life looks pretty good: Samsung is promising up to six hours of Bluetooth streaming and up to five hours of calls. If that doesn't sound like a lot, consider that the case holds up to seven hours of charge and, best of all, can replenish just over 100 minutes worth of power in a 15-minute charge. And if you have Samsung's new S10 smartphone, you can actually use the phone to wirelessly charge the earbuds just by placing the case on the handset, using Samsung's new PowerShare feature. The Galaxy Buds also work with Bixby on its Galaxy phones, should you want to use Samsung's assistant to make calls, send messages or check the battery life. What the new Buds seem to be lacking are any dedicated sports features, so it looks like Samsung is focusing on audio, assistance and beefing up that battery. But we'll take it. We had a lot of love for the Gear IconX, although we weren't the biggest fans of the annoying tap controls and Bluetooth problems. Here's hoping Samsung has fixed all of that with the new Galaxy Buds. While battery life is only a little better than the IconX, the fast-charging on the Galaxy Buds is more efficient, and the added option of charging using the S10 is rather neat. Like the Galaxy Watch Active, the Galaxy Buds launch on 8 March. They come in white or black options, and will cost $129.99. Unless you pre-order one of Samsung's new S10 smartphones, in which case it's throwing in the Galaxy Buds for free.